In the Nigerian village of Umuoye Enyiogugu, Mbaise, where Mercy Egbujor grew up, nobody ever talked about the ending the scourge of homelessness. There wasn’t any. “Everybody had a mud house,” she says. 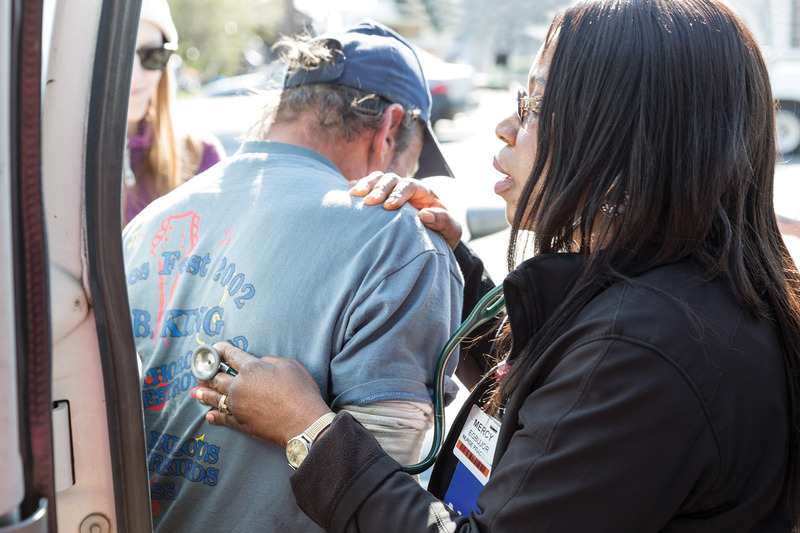 In 1998, as the creek beds that encircle San Jose’s downtown were being transformed into a moat of misery by a rapidly rising homeless population, Mercy arrived at the Valley Homeless Healthcare clinic as a student nurse practitioner for her first rotation. She never left. “I felt like I was home,” she says. In 2014, she officially became “Dr. Mercy,” creating a backpack medicine unit—that she continues to lead—as her doctoral thesis for San Jose State’s inaugural Doctor of Nursing Practice Program (DNP). Actually, nursing was a surprise, especially to Mercy, who attended San Jose State intent on becoming a journalist. To cover school expenses, she had taken a job as a nurse’s aide, emptying bedpans and decoding dementia at a nursing home, and only months from graduation, she realized she had stumbled upon her true calling. 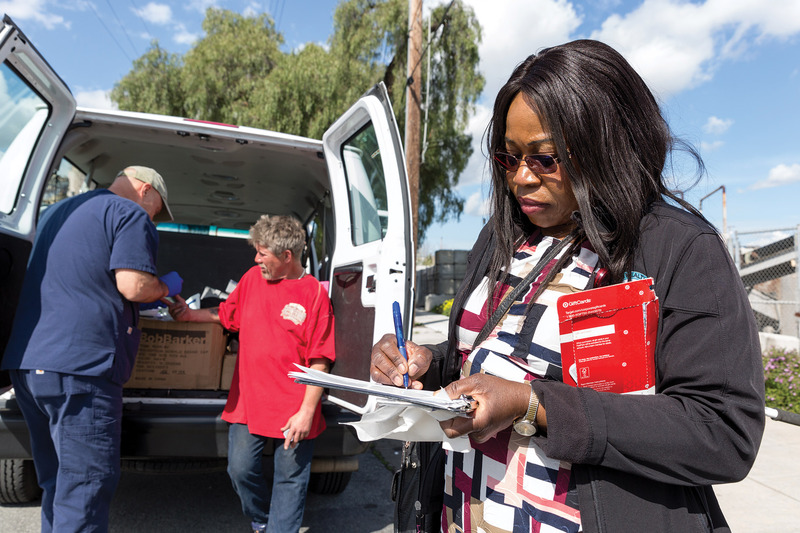 Another decade of training led to a master’s degree and work as a nurse practitioner at a clinic, where Mercy first encountered the subtle shrug of institutional disregard for the homeless. Patients recovering from surgery were sometimes driven from Valley Medical Center to encampments with names like Jurassic Park, Narnia and—most notoriously—the Jungle, where they were discharged, literally, into the wild. Monica Hyatt spent several years living in the Jungle, which was believed to be America’s largest homeless encampment, before the city of San Jose shut it down in 2014. When the Valley Homeless Healthcare medical team made weekly visits to a parking area near the Jungle, Hyatt refused to see them. So the backpack team, led by Mercy, descended into the hellscape of tents and tarps, where they found Hyatt in precarious shape. On a recent Friday morning, the backpack team pulled up to a corner in an industrial area next to Central Concrete, and from the rusted hulks of ancient RVs clustered at a nearby railroad siding, one-by-one, four patients warily approached the van. One man says he was in prison for 15 years, and refused surgery for his back pain, explaining, “I don’t trust them to wake me up.” He says he’s been homeless for 12 years, since his wife died at 31. The man says he drinks four pints of whisky a day, at which Mercy gently reminds him that this will not help his Hepatitis C.
She spends more time with each patient than a clinical physician would—or could, her approach at odds with the often depersonalized medicine practiced today. A patient named Dave tells her he drinks vodka to stay warm every time he wakes up at night. Mercy laughs at his jokes, and gently fends off a flirtation, assuring the man she is happily married. As he is about to leave, Dave mentions that his father drove a truck for Central Concrete for 32 years. At another stop in downtown San Jose, Mercy talks to a transgender woman named Michelle, who is wearing a white turban fashioned out of a T-shirt. “I need a lotta help, honey,” Michelle tells her, while nearby Block is drawing blood from Michelle’s boyfriend of more than three decades. They became homeless five years ago, when rents in Oakland became unaffordable. 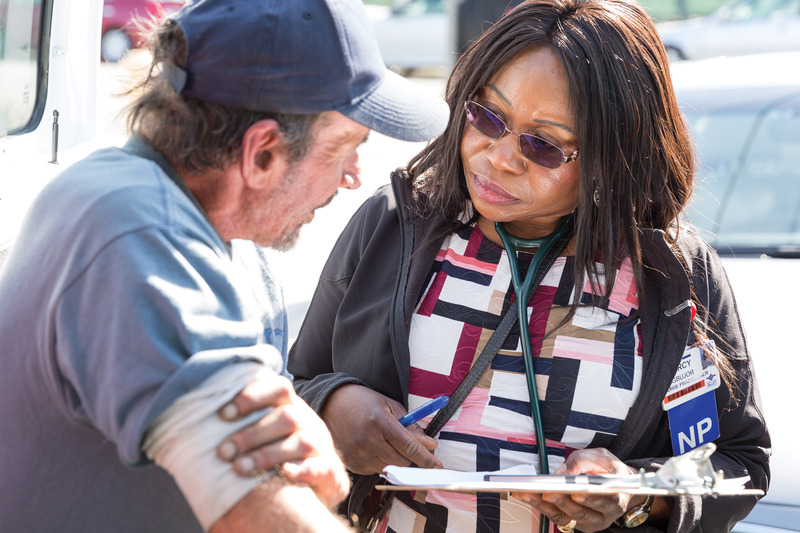 Mercy became so frustrated seeing surgical patients dropped off in wheelchairs at homeless shelters that she and a doctor at Valley Medical created the hospital’s Respite Center. There, patients who can no longer occupy a hospital bed, but who still need a safe place to recuperate, can recover in peace. “She’s the kind of person who goes all the way with her patients, the kind of nurse that never gives up,” says Sandy Couser, ’80 MS Nursing, who taught the statewide nurse practitioner program from which Mercy earned her master’s degree. Couser was so sure her star student had the wealth of compassion she would need to help the homeless, she hired her at Valley Medical. That was 16 years ago, during which time the homeless population in San Jose has grown alarmingly. 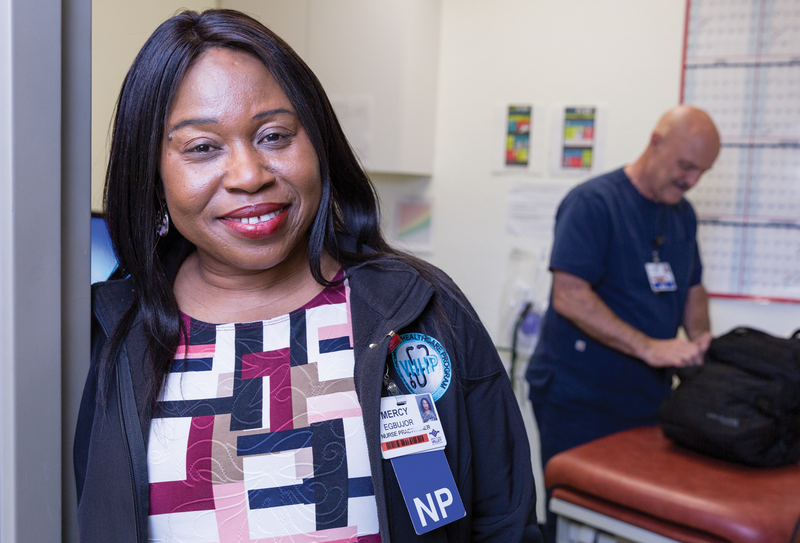 Worried that people who were just trying to survive from one day to the next wouldn’t seek medical care at her clinic, Mercy returned to San Jose State as part of the first Doctor of Nursing Practice cohort. In 2014, she became Mercy Egbujor, DNP. Wow! Amazing story. Very well written. It brought tears to my eyes to read about what good Mercy is doing for our community. Congratulations on getting your DNP!